🏔🤼‍♀️🤼‍♂️ WRES RECAP | The Cascades got off to a strong start on Day 1 of the @CanadaWest Championships, highlighted by a dual victory for the men's team over @UCDinos! Day 1 of the Canada West Wrestling Championships is in the books, and the host University of the Fraser Valley Cascades are off to a solid start. 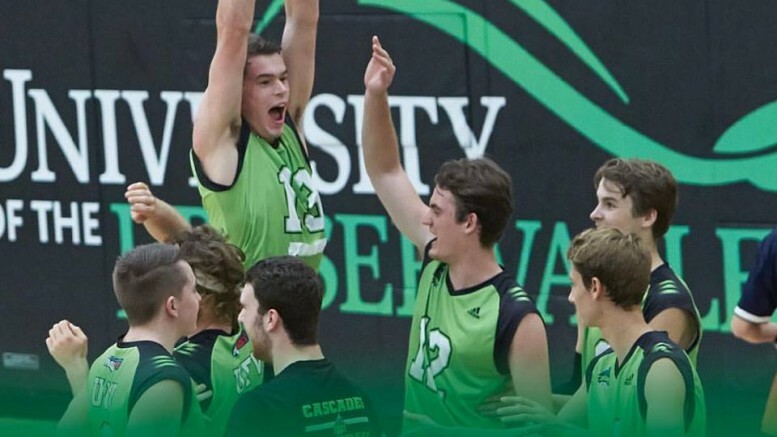 Competing before an enthusiastic crowd at the Envision Financial Athletic Centre on Friday evening, the Cascades men’s team won its first dual match-up, defeating the Calgary Dinos by a score of 29-21. Reigning U SPORTS national champions Parker McBride (57 kg) and Brad Hildenbrandt (120 kg) were dominant, winning their matches via pin. Simren Brar (54 kg), De’Andre Williams (68 kg) and Karan Dhillon (82 kg) defeated their Dinos counterparts by technical superiority, while Sunny Benning (90 kg) and Amarvir Atwal (72 kg) earned decisions. Ali Rahguzar (61 kg) dropped a hard-fought 14-12 decision to Calgary’s Brendan McKeage, while Jason Bains (100 kg) was forced to exit his match early due to injury. On the women’s side, the Dinos’ more sizeable roster netted them an 18-10 dual win over the Cascades. 2018 Canada West champ and U SPORTS silver medalist Ana Godinez Gonzalez was typically dominant, earning an 11-0 technical victory over Vivian Mark in the 63 kg class. Amber Wiebe battled Tianna Kennett in a thriller but dropped a 6-4 decision, while Calista Espinosa (48 kg) received a bye. Over on Mat 2, the Alberta Golden Bears and Pandas were battling the Saskatchewan Huskies, and it was the Huskies earning a sweep on both the women’s and men’s sides. The Sask women’s squad opened with a 24-12 triumph over the Pandas in Round 1, and the Huskies men followed by edging their Golden Bears counterparts 26-24 in thrilling fashion. In the last match of the night, Sask heavyweight Kalin Langford pinned Alberta’s Tyler Duguid to earn five points for his team and seal the dual win. For the second year in a row, the University of the Fraser Valley women’s basketball team saw its season come to an end in Victoria. Amira Giannattasio led the charge for the hosts, scoring 22 of her game-high 26 points in the first half as the No. 7-seeded Victoria Vikes knocked off the No. 10 Cascades 80-61 in their Canada West first-round single-elimination clash on Friday evening. Taylor Claggett responded with 16 points, five assists and five rebounds for the Cascades. “They (the Vikes) execute very well, and they’ve got players who can really make shots and make tough plays – they’re a good team,” UFV head coach Al Tuchscherer said afterward. The Cascades had a steady start, leading 5-3 three minutes into the first quarter after Amanda Thompson knocked down a triple. The Vikes, though, would end the frame on a 17-4 run, with Giannattasio scoring 11 points during that stretch. UFV would get back to within 25-18 in the second quarter after Kate Head hit back-to-back treys, but the Vikes responded by scoring the next six points and took a 39-23 lead into halftime. UVic stretched the lead to 20 in the third, and while the Cascades battled to deflate the deficit, the offensively potent hosts were able to answer every surge with one of their own. Head posted a double-double with 10 points and 10 rebounds, and Thompson and Natalie Rathler scored seven points apiece. Morgan Roskelley sparked the Vikes off the bench with 17 points, while Ashlyn Day, Katie Langdon and Calli McMillan scored 10 apiece. The good news for a relatively youthful Cascades squad is, every player on their roster is eligible to return – fourth-year Claggett was the team’s most veteran player this season. Additionally, rookies like Rathler, Abby Zawada and Madeline Beerwald all played key minutes this season and got great experience, and the team will be further augmented by an outstanding 2019 recruiting class. The University of the Fraser Valley men’s volleyball team started strong, but ran out of gas as the Douglas Royals prevailed in four sets on Friday night in New Westminster. The Cascades got off to a great start, winning the first set 25-21, but the Royals stormed back to secure the next three by scores of 25-19, 25-21, and 25-15. The CCAA No. 4-ranked Royals improved to 19-3 with the victory, while the Cascades fell to 1-21. The Cascades grabbed a 4-0 lead in the first set with Adam Frederickson serving, and carried that through for a 25-21 win. The second was tight early, but the Royals would earn an 11-9 advantage, before extending it to 19-13 and eventually winning 25-19. The score was level at 21-21 in the third, but Douglas reeled off the last four points of the set to take it 25-21. The Royals came out flying in the fourth, snagging a 20-11 lead before closing out the match 25-15. Donen lauded the play of his middles – Josh Fefchak registered a team-high nine kills, and Jackson Obst had five. Right side Graeme Hughes chipped in with seven kills of his own. Reid Marriott led the Royals attack with 23 kills, while Max Haronga had 16. Up next for the Cascades volleyball teams is a home-and-home series with crosstown rival Columbia Bible College Bearcats. On Thursday they visit the Bearcats, before shifting to the Envision Financial Athletic Centre on Friday to close out the regular season (women 6 p.m., men 8 p.m. both nights). The University of the Fraser Valley women’s volleyball team provided a much stiffer test for the reigning PACWEST champion Douglas Royals on Friday evening, but the Royals nevertheless prevailed in straight sets in New Westminster. The CCAA No. 10-ranked Cascades had struggled in Thursday’s three-set home loss to No. 3 Douglas, but played “much better” in head coach Mike Gilray’s estimation in the rematch, falling in a trio of hard-fought sets (25-22, 25-23, 25-21). In the first set, the Cascades (12-10) fell behind 19-12, but battled back to even the score at 21-21. The Royals (16-6) regrouped, though, and finished off the first set 25-22. The second set was the turning point of the match as UFV built a 13-3 lead, only to watch the hosts come surging back, closing the gap to 21-19. A five-point service run by Grace Warkentin gave the Royals a 24-21 advantage and they would go on to take it 25-23. The Royals continued their strong play in the third, developing a 12-7 lead after a six-serve run by Emma Schill on their way to close out the match 25-21. UFV libero Cassidy King had a huge night, racking up 32 digs. Kristen McBride had a team-high six kills for the Cascades, while Kim Bauder and Keira Fisher each had five. Vania Oliveira led the way for the Royals with a game-high 10 kills, followed by Caet McCorkell with eight. Up next for the Cascades volleyball teams is a home-and-home series with the cross-town rival Columbia Bible College Bearcats. On Thursday they visit the Bearcats, before shifting to the Envision Financial Athletic Centre on Friday to close out the regular season (women 6 p.m., men 8 p.m. both nights). Be the first to comment on "UFV Sports Friday – Women’s Hoops Season Done, Volleyball, Canada West Wrestling Championships"